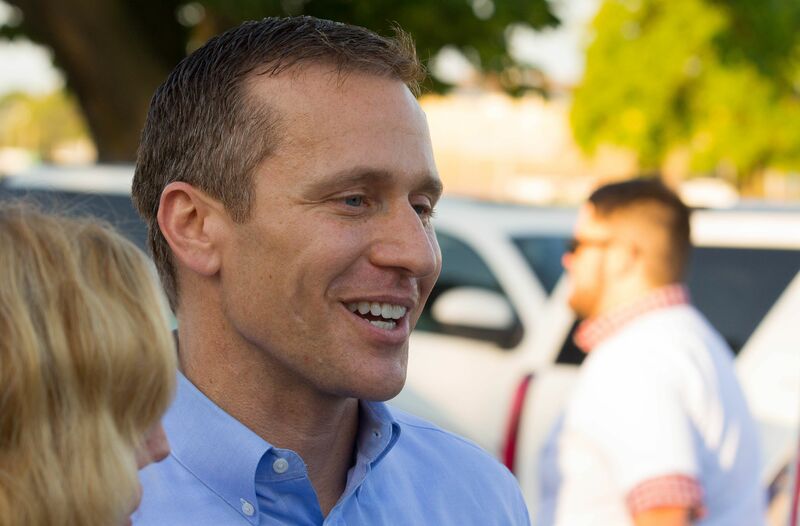 The republican leadership in the Missouri General Assembly is calling for Eric Greitens (r) to resign. I will not be resigning the Governor’s office. In three weeks, this matter will go to a court of law—where it belongs and where the facts will prove my innocence. Until then, I will do what the people of Missouri sent me here to do: to serve them and work hard on their behalf. Resign. Missourians deserve better than a manipulative, sexually abusive man in the Governor’s Mansion. Wait. All of your crimes go to trial in three weeks? The sexual assault stuff and the charity stuff? It’s hard to keep up so please forgive me for not knowing which alleged crimes we’re talking about here, Governor. Well, this is one Republican who worked to get you elected, and I now believe very strongly you need to resign for the good of this state. I made a mistake. It is now time to do what is right. Please step aside. I pray for God to forgive you. Then let the impeachment proceedings begin. 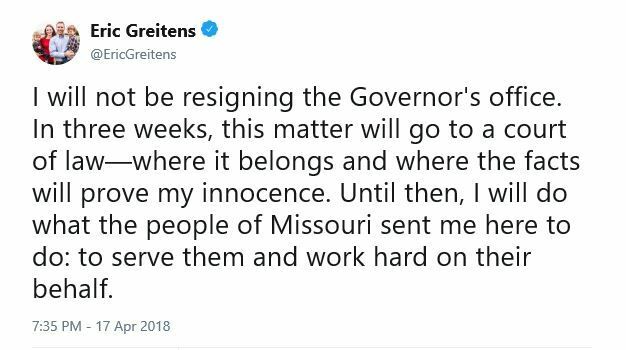 If you had any concern for the people of Missouri then you would resign. No do the right thing and resign. Look at what constituents are saying ! Grovel out ! If only you realized that impeachment does not require a conviction in a court of law. You are an embarrassment to our state and if you had a shred of integrity you would resign. You don’t need to resign, the General Assembly is going to fire you. you are a pathetic fool. No shame. Seek mental health counseling. You’re only serving your ego and the dark money that got you elected. I can’t believe I voted for you. You’re putting yourself before missourians you about to have another case against you a very strong case. Let the impeachment process begin. @MOHouseGOP: impeach him now. Save Missouri from further embarrassment. You need to resign. Your arrogance and toxic, sick macho act are the last things we need in government. God willing, your political career has been raptured. This will be your legacy, governor. I voted for you. I’m sorry I did. You do NOT have a mandate to lead. Step aside so #Misssouri can get to work. By all means, don’t. It will be so much more satisfying to watch you lose every shred of dignity on the way out. Cool. They’ll just forcibly remove you then. I can’t believe this guy is clinging to power. Step down Dude. It’s over. You’re not serving the people of Missouri very well under these circumstances. The consensus begs to differ. I think you are being pretty foolish. You need to step down. Walk out or booted out, the end result will be that you’ll be out. It’s coming. You sir are a complete moron and you will be removed by impeachment. Good day! Why? To spread those good family values you preached on the campaign trail?? Resigning would be the last bit of pride you have left. Disgraceful. On behalf of Sen. McCaskill thank you for the smooth road to a Dem Majority. Yeah, good luck with that. People really hate you. the facts are, that you are not fit to serve in office. Do the right thing and resign. Know when to call it quits, Governor. For reference, that was three weeks ago. You don’t work on my behalf. Go away.